If boat diving you should be aware of the advice and guidance in the Harbour Master's Directions and Port Information Guide so as to be able to plan dives in accordance with the regulations and practices that govern vessel operations within the port waters of the Port of Melbourne. There are a number of Facebook groups that are great resources for finding out more about local dive sites. Don't forget to join our own group The Scuba Doctor, and follow our Facebook page The Scuba Doctor, for all of the latest news. 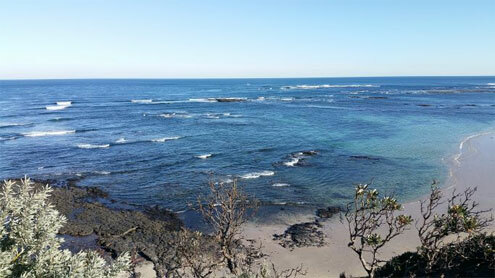 Low Northerly Winds of 5-10 knots will make snorkelling both inside the bay and out pleasurable. High Northerly Winds exceeding 15 knots will usually cause the bay to be quite rough. Southerly Winds of up to 15-20 knots won't affect the bay too badly, but will generate quite a large swell outside the heads and on the back beaches. Tides and Tidal Streams/Flows are strongest near Port Phillip Heads while the top (Melbourne) end of the bay is less prone to strong currents. Tidal Currents are extremely strong near bay openings (Flinders, Point Nepean and Point Lonsdale) and are best dived at slack water (the period in which there is little to no tidal activity). See Diving in Melbourne Currents. Back Beaches (or the Surf Beaches) are prone to rip currents where the surface water will be turbid, foamy, discoloured and generally moving out seaward. See Diving the Back Beaches. Tide times can be checked online, or with your local dive shop. See Weather, Tides, Conditions etc..
November–March: (Summer) Has the warmest waters, but visibility may be compromised with plankton growth. April–July: Has the best visibility due to low plankton growth, but the water temperature also drops considerably. August–October: (Winter) May have challenging weather conditions above water, but good and relatively clear diving conditions below. Rains wash out dirt and materials into bay dive site that affect visibility and conditions usually take about 2 days to return to previous visibility levels. Don't ask me why I dive. Ask yourself why you don't.